Do you know how to write an abstract? Writing an abstract is important because it determines whether the reader will proceed to read the complete study. What to include in an abstract of a lab report or research project depends on the field of study. For example, if it is related to a social science or general scientific essay, it will generally consist of the scope, purpose, results and information contained in the study. On the other hand, if it is related to humanities, it should include the thesis, background information and conclusions. Keep in mind that as you learn how to make an abstract, you are not evaluating the paper itself. Why exactly is the abstract important? When researchers, authors and PhD candidates hope to secure grants and get their article or research proposal published, the abstract essentially promotes the work by providing a concise and succinct summary. This is why it is necessarily to learn how to write a research abstract properly. Note that there are two common types of abstracts: descriptive and informative. The descriptive abstract defines the information that is contained in the report. However, it does not critique the paper nor does it include results or conclusions about the work. However, it can summarize the research's purpose, methods and scope. You might be wondering, "How long should an abstract be?" It should generally not exceed 100 words. Most abstracts fall into the informative category. Although they are not a subjective evaluation, they nonetheless go beyond mere description. When written well, a scientific abstract is able to promote the paper by presenting and explaining all of the key arguments as well as the evidence and results. Unlike the descriptive type of abstract, the informative does include the results and conclusions of the paper along with recommendations. How long is an abstract of this type? Usually around 10% of the total length of the full paper. Citations of the sources in MLA format or APA format. Placing the key information from the study at the beginning. The same word usage found in the paper itself. Key words and phrases so that other researchers can easily retrieve it when looking for research studies. Language that is clear, brief and leaves a good impression. What does an abstract mean? The abstract is placed at the beginning of the work and provides a summary. It is not like an introduction though in that it does not introduce the reader to the topic. Instead, it offers an overview of what you write about in your article. Wait until you finish the paper before you start the rewrite even if you know what you intend to write about. Note that the abstract and thesis are not the same. 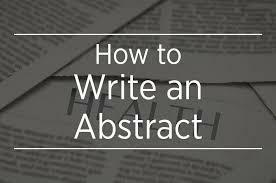 The definition of an abstract is a summary review of the entire paper, including the methods and results while the thesis presents an argument or chooses a problem to test and explore. Now that you have been provided with an abstract writing definition, you should have a better idea about the meaning of an abstract. However, note that the requirements for your abstract could vary to some degree depending on your professor's requirements. Before you start working on it, make sure you understand what your professor wants. Take a look at the rubric or ask for clarification. As you write the abstract, be aware of the target audience as the abstract allows them to find your work and decide whether it is relevant to their own research. The abstract is not a platform for leaving the reader in suspense; you want them to know what your research uncovered and what can be drawn from the conclusions. They can then proceed to read the entire paper to get a fuller explanation for how you reached your results. Why did you choose this topic? Why did you decide your particular approach was best? What is the importance of this research? Why should others be interested in reading the entire paper? The abstract discusses the problem statement or argument that your paper is built around. When you select the problem, you need to explain your motivation for choosing it as well as how you decided to tackle it. In particular, you should discuss your methods. Once you've done this, you can provide an overview of how your achieved the results in your study. If you collected primary data or secondary data, you will discuss this as well. If you are writing an informative abstract, you will discuss the results of your study as well as your conclusions. This is how you will finish your abstract. Next, we will discuss the parts of the abstract. Let us discuss further the purpose of an abstract. Although the abstract is meant to be brief, it is still very important and therefore it must accomplish a lot. As you writing it, devote around one sentence for each section. However, there is some flexibility. For instance, you can merge parts of the paper together or spread out the information among several sentences. Here are some key ideas to think about as you write the abstract. Why is this issue worth exploring? If the problem statement is somewhat dry, you might want to start your abstract by explaining your motivation for uncovering questions related to this problem. On the other hand, if you are looking for solutions to a problem that can universally be regarded as interesting, feel free to start off with the problem statement. This section should discuss the significance of the study, the challenges to completing it as well as the gaps in the research, and the broader implications of your research. What issue is being explored? What are you hoping to accomplish? Are you looking to find a general approach to your problem, or are you honing in on a very specific element of that problem? You would want to explore a problem for which there is a lack of information. Thus, as you reference other studies, you will want to discuss the gaps in the research. Since this is an academic paper, avoid using informal language. As alluded to, if you feel that the audience already understands why the problem is important, you can start with the problem statement. However, if it is obscure or on the surface seems less interesting, you should begin by discussing your motivation for choosing this particular study. What methods or approaches did you use as you tried to solve the problem or at least make progress? Some possible methods include analytic models, simulations, and analysis of field data. How thorough was your approach? Did you use a variety of computer applications or did you just stick to one? What were the dependent and independent variables? How did you control for them and come up with your measurements and formulas? What did you ultimately come up with? Did you come up with a more efficient way to allocate resources? Did you find a more effective approach to solving a problem? It is very important that you be able to quantify your results through statistical data. You should also make sure that any numbers you show leave little room for ambiguity nor should they be misinterpreted. You also do not have enough room in your paper to discuss every single caveat, so make sure to keep that in mind as you caution the reader about how to read into the results. Now that you have the answers and have come up with some evidence to back it up, what are the broader implications? It probably will not be something that changes the world forever, but it could nonetheless have some kind of impact. Does it make some process easier? Can the results that you produced be applied in general, related areas? Or are they highly specific to your situation only? When you write your abstract, even though it is brief it must contain all of the important points. In other words, it must be fully self-contained and not require that the reader look through the paper to find general information not found in the abstract. While obviously the full paper will go into full detail about how the results were achieved, the abstract must nonetheless be logical and make sense on its own. Adhere to the word count limitations. Most of them should be between 100 and 200 words. If you write an abstract that is too long, very few people will want to read it. In fact, it could be rejected outright by a professor or publisher. Also keep in mind that if it is too long, your professor could take it upon themselves to reduce the size. Obviously, you would prefer to be the one who decides what goes in and what can be put on the chopping block. If there are limitations on the results, it is okay to speculate on why they occur. In this situation you can use words like "might," "could," and "seem." Do not underestimate the importance of keywords and phrases. In fact, some publications require them. After all, this is how the reader will ultimately come upon your abstract and, hopefully, will read the entire paper and gain something from it (if they are a researcher) or offer you grants or publications in their journal (if they are a committee or editors). While topics with particular focus (such as dentistry) will find themselves in dental-related publications, if your research study focuses on something novel or untraditional, specify in your problem statement which domain or topic area your research could be applied to. Good presentation means everything. In other words, the content of your abstract should be organized properly and logically. Furthermore, you would not want to write an abstract that contains typos or grammar mistakes since you will immediately lose credibility in the mind of the reader or publisher. So once you finish writing a draft of your abstract, it is important to go back and correct any mistakes. Since your abstract will not be all that long (perhaps half a page), this will not be a particularly time-consuming task. But it will definitely be an extremely important one with major implications. Tomoyuki Yamashita – guilty or innocent?